The double-headed eagle is a relative newcomer in the inventory of symbols decorating traditional Russian towels. Adopted by the Russian tsars in the 15th century, the double-headed eagle represents Russian statehood. 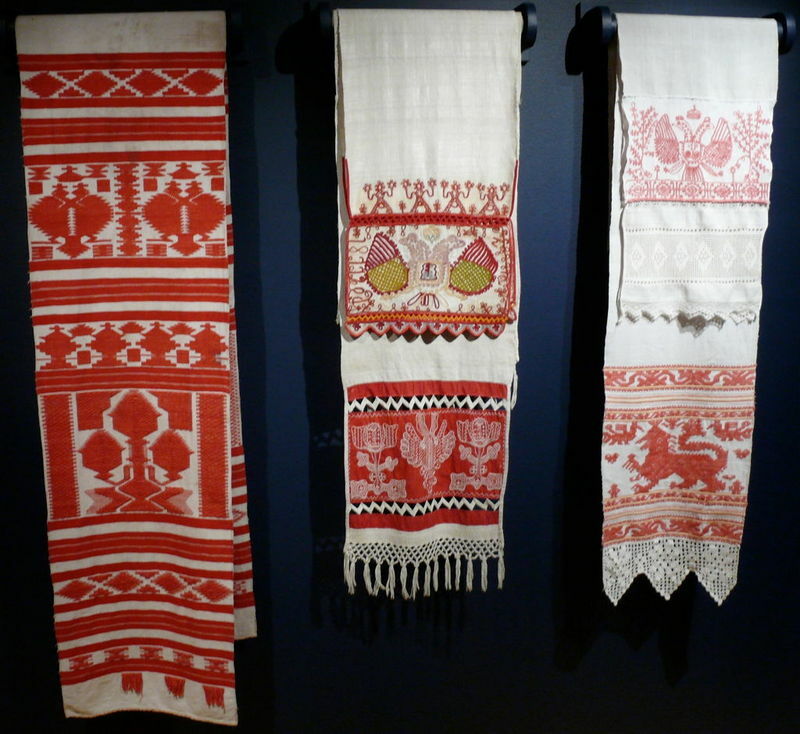 In the 19th century, urban culture began to influence textile art in villages. Samovars and double-headed eagles assumed a place of honor in traditional scenes depicting the ancient goddess of fertility and the Tree of Life. New themes and techniques were borrowed from lithographs sold at country fairs and from store-bought candy and soap wrappers. In the late 19th century, the French soap firm Brokart was selling inexpensive soap throughout Russia with cross-stitch patterns on their wrappers. The patterns featured flower garlands that soon became popular with peasant crafters who were gradually losing touch with ancient imagery. Display of Embroidered Towels with Double-Headed Eagle, early 19th-late 20th century. Russia. Private Collection of Susan Johnson. Varied materials and techniques.